Please complete the form below and your enquiry will be sent directly to Vine to Valley Run My Wines Trail Run Series via email. 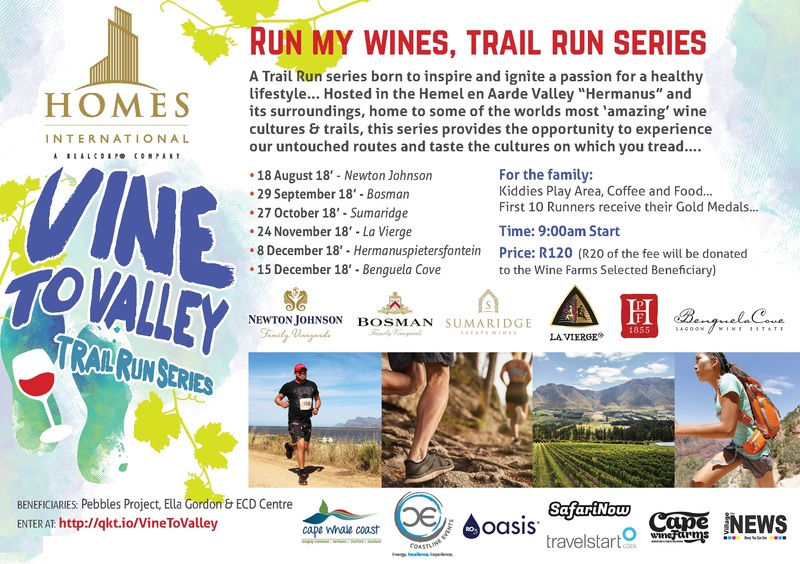 Your enquiry has been sent to Vine to Valley Run My Wines Trail Run Series. A Trail Run Series born to inspire and ignite a passion for a healthy lifestyle. Hosted in the Hemel en Aarde "Hermanus" and its surroundings. The alluring Hemel-en-Aarde Valley lies on the outskirts of the Overberg Coastal town of Hermanus. The terroir of this splendid valley lends itself to many distinguished wine farms who will be welcoming you on the Vine to Valley Run My Vines Trail Running experience. If you are driven to pursue an active and healthy lifestyle or to just have a fun outing, then traversing the undulating landscapes that will unfold in front of you will surpass your expectations. Imagine leaving your footprints on wine farms that have not only been producing wine for generations but also bring you some of the top award-winning wines, which you will be able to taste. Complete the entire series and you will receive a bottle of these superlative wines from each farm. Click on 'More Info' below to find out more about the Vine to Valley Run My Wines Trail Run Series and how you can enter. All trail runners will receive a Vine to Valley medal. All trail runners to complete the series will receive a bottle of these superlative wines from each wine farm ran in the series. Only distances above 10 km are timed. The first 10 runners to cross the line at each race will receive a medal for their win. These untouched vineyard running trails will offer a unique vineyard running experience of the Hermanus vineyards, and afterwards you can enjoy a selection food, coffee and of course wine with your family and friends while the kids get to play in Nature *Please note the play areas are very unique to each wine farm and are all outside.